Why bother going to Ibiza this summer? Beaufort House Chelsea is bringing Ibiza to you! Situated on the fashionable, stylish Kings Road, Beaufort House is creating its own tropical atmosphere that will come to life every Saturday afternoon from 3pm ’til sundown. As many of you know our proud labrador, ‘Beaufort’, or ‘Beau’ to his friends, has decided to come out and play!! Beau just wants to have fun; and what Beau wants, Beau gets – and Beau wants a BEACH PARTYY!! So put on those swanky boat shoes, shorts and shades we have all missed over the dark winter months and come and PARTY WITH BEAU! 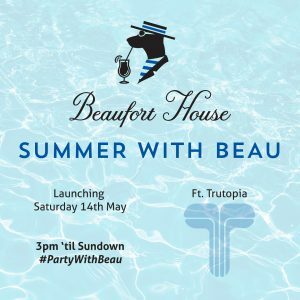 Beaufort House will be opening its summer doors every Saturday from the 14th of May and hosting DJ’s from 3pm playing your favourite summer tunes, so pop down to your friendly neighbourhood beach bar; relax, eat, drink, have a boogie and enjoy your summer with Beau!